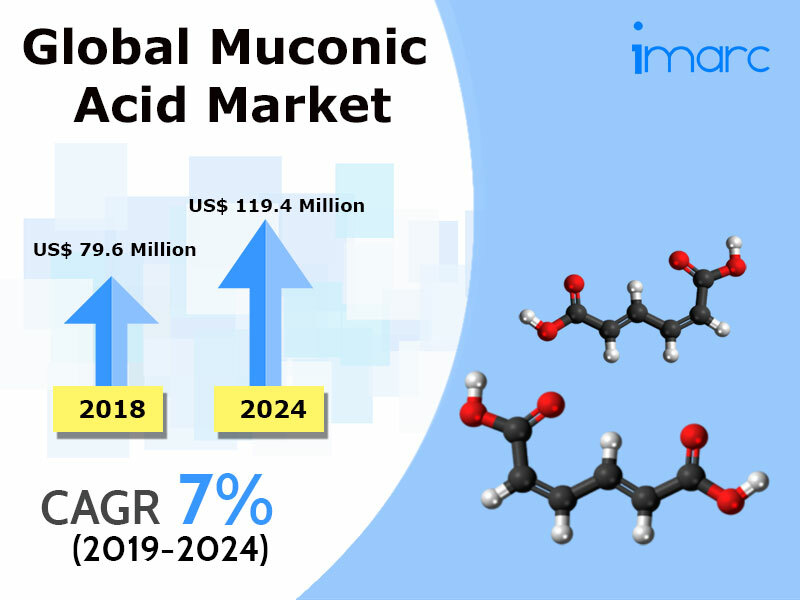 As per the recent market research report by IMARC Group, titled “Muconic Acid Market: Global Industry Trends, Share, Size, Growth, Opportunity and Forecast 2019-2024”, the global muconic acid market reached a value of US$ 79.6 Million in 2018. Muconic acid is a hexadienedioic acid with the chemical formula C6H6O4. It is a high-value bio-product with conjugated double bonds and reactive dicarboxylic groups. The acid can be derived in three isomers, namely trans, trans-muconic acid; cis, cis-muconic acid; and cis, trans-muconic acid. It has garnered potential applications in the manufacturing of bio-plastics, agrochemicals, pharmaceuticals, new functional resins and food additives. Apart from this, it is also used in the commercial production of bulk chemicals like trimellitic acid, adipic acid, terephthalic acid and caprolactam. These compounds are further utilized for manufacturing textiles, lubricants, carpets and plastics. Muconic acid has gained popularity in several sectors as a base chemical. Adipic acid, one of its derivatives, is extensively used for the production of nylon 6,6, polyethylene terephthalate (PET) and polyurethane (as an intermediate). Nylon fibers further find applications in the automobile and textile industries. Caprolactam is also utilized in the making of film coatings, paint, synthetic leather, brush bristles and textile stiffeners. Further, recent innovations have encouraged the production of muconic acid via genetically modified microbial species. In confluence with this, rising inclination towards bio-based products among users is creating new opportunities for both the existing and new players in the industry. As a result of these factors, the market is anticipated to grow at a CAGR of more than 7% during the forecast period (2019-2024), reaching a value of US$ 119.4 Million by 2024. On the basis of derivatives, the market has been divided into adipic acid, caprolactam and others. As there is a high demand for adipic acid across different sectors, muconic acid is mostly used in its production. Some of the major application areas of this acid include carpets and textiles, plastics and lubricants. Amongst these, the carpets and textiles segment represents the largest application area, holding the dominant share. Region-wise, North America is the leading market, accounting for the majority of the market share. Asia Pacific, Europe, Middle East and Africa, and Latin America are the other major markets. According to the analysis of the competitive landscape, Merck, Deinove, Amyris, Sigma-Aldrich Corporation, Myriant Corporation, Santa Cruz Biotechnology, Dynacare, TCI, Alfa Aesar, Thermo Fisher Scientific, Zhongxing Flavors & Fragrance and Toronto Research Chemicals are the key players operating in the muconic acid industry.